Happy Saturday, Technique Junkies! It's Janelle here today with a burst of Shimmering Bliss for a circus and monkey card! 10% at the Technique Junkies store! Use code TJ10Janelle at checkout! When I saw the Not My Circus stamp I thought shimmering sunburst of color, so that was my inspiration for this card. 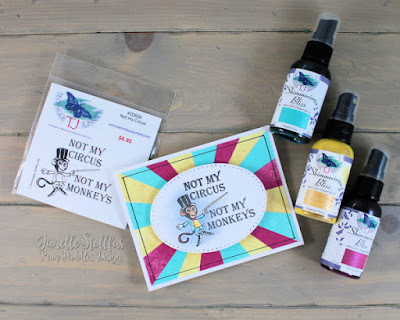 Grab your Shimmering Bliss Sprays and let's have some fun making a sunburst of color for Not My Circus stamp! For the colors on the sunburst, I used Shimmering Bliss Sprays in Thulian Pink, Imperial Yellow, and Miami Vice. My method for creating the sunburst was to quickly spray three 4-1/4 x 5-1/2 inch white cardstock with each Shimmering Bliss Sprays and then stack them before cutting them. Color side down mark around the edges halfway on each side, top, and bottom, then the sides once more so there are four bursts. The top and bottom get the same done, but you'll notice that I was in another universe when I measured mine and made six sunbursts! On a white cardstock score across the center horizontally and vertically at 2-1/8 inch and 2-3/4 inch. This will help you glue from the exact center for your card. Start gluing each piece from one of the scored lines and go around until they are all glued on. You will have extras to make another card, too! 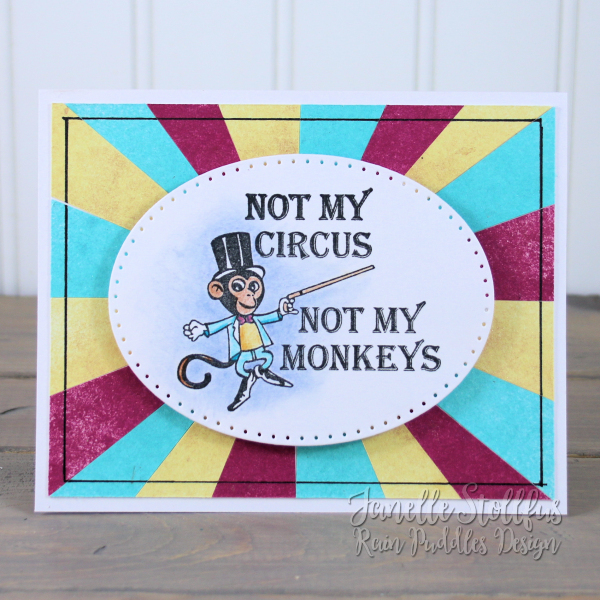 I colored Not My Circus with colored pencils that were close in hue to the sprays and then used an oval die cut for a fun focal shape. Pop it up with adhesive foam, That's it! Remember, all of the stamps in the LOVE Category are on sale for 20% off now through January 31st! No code needed! 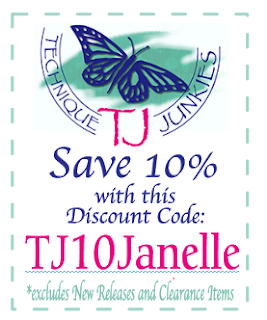 And shop with code TJ10Janelle at checkout for 10% off! Happy shopping! Check out my other Technique Junkies projects on my blog at Rain Puddles Design.